The Lemon Creek Harmonica Band was a long-enduring and well-loved musical group, a legacy of popular harmonica bands of the 1930s and 1940s. It was formed during the internment at the Lemon Creek internment camp by a group of young Nisei men who needed a diversion from internment life and was led by Junji Ikeno with assistance from Roy Kumano. They played two concerts: the opening of the Lemon Creek School in 1943, and on May Day, 1944, after which they disbanded when Ikeno moved to Kaslo to work on The New Canadian*. 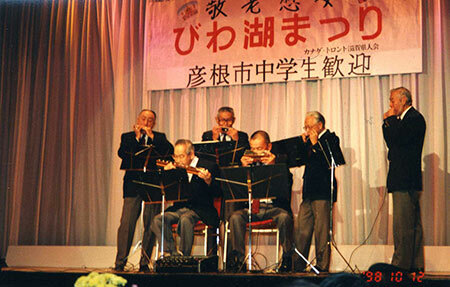 However, the group reunited at the first Lemon Creek reunion in 1980 in Toronto, when six former members performed old favourite songs, including their trademark Uramachi Jinsei and You Are My Sunshine. 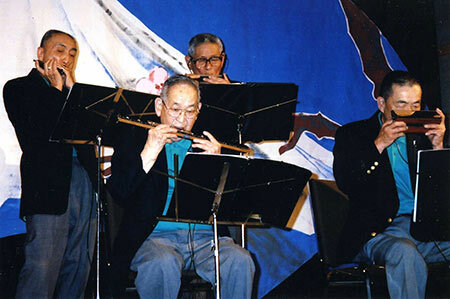 They continued to play at various Japanese Canadian cultural events in Toronto, Hamilton, and even at the Powell Street Festival in Vancouver, for many years after, and released an album in 2001.